An AUTOMATED STORAGE/RETRIEVAL (AS/R) system is a strategic investment for a fabrication operation. It delivers a competitive advantage that enables manufacturers to meet changing customer demands with significant operational efficiencies. The benefits of an AS/R system include reduced labor for transporting material/worksheets into and out of inventory and optimizing floor space costs by storing vertically. Sheets are often stored more densely than in systems where they are stored and retrieved manually. An AS/R system can be utilized to support all functions within your fabrication operation including cutting, bending, welding and finishing. The systems operate under computerized control, maintaining an inventory of stored sheets in various stages of production. The computer determines where in the storage area the sheets can be retrieved and schedules the delivery through a system of conveyors and or automated robotic handlers that moves them to the manufacturing floor. 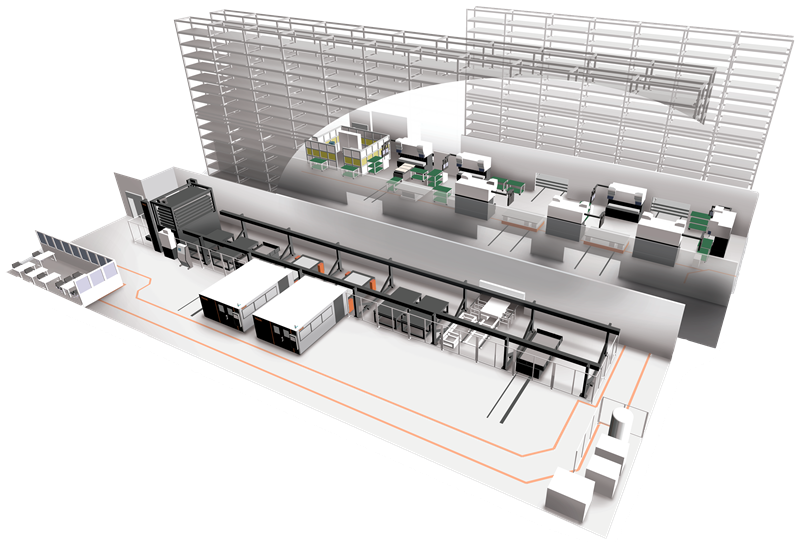 Mazak AS/R systems can be integrated with LASER FLEX, MODULAR COMPACT, LATERAL COMPACT and EXTENSIBLE MANUFACTURING CELLS. They can be designed to store/retrieve 2412, 3015 and 4020 size worksheets.